WASHINGTON — The Obama administration argued yesterday that its nearly three-month military involvement in Libya does not require congressional approval, due to the supporting role most US forces are playing. The position puts the White House at odds with Republican leaders and the antiwar wing of its own party. It was the administration’s first detailed response to complaints from lawmakers of both parties, who say President Obama has exceeded his authority. Those complaints have grown louder and attracted more lawmakers with each passing week of the Libya operation, which the administration has said is making progress in forcing Moammar Khadafy from power. The demand that Obama secure congressional approval has brought together House Republicans and liberal Democrats, some of whom joined together yesterday to file suit in federal court to stop US participation in the war. Representative Michael Capuano of Massachusetts, Democrat of Somerville, was one of 10 lawmakers filing suit. The administration’s report is unlikely to appease congressional leaders concerned over Obama’s strategy in Libya or the rising costs of the war, one of three the administration is fighting. But senior administration officials say Obama has participated in the Libya campaign in a way that is consistent with the War Powers Resolution, passed by Congress in 1973 in an attempt to constrain a president’s war-making capabilities following the undeclared conflicts in Vietnam and Korea. “We’re not engaged in sustained fighting,’’ said one senior administration official. “There’s been no exchange of fire with hostile forces. We don’t have troops on the ground. We don’t risk casualties to those troops. The report put the cost of US military operations and humanitarian assistance in Libya at about $800 million as of June 3. 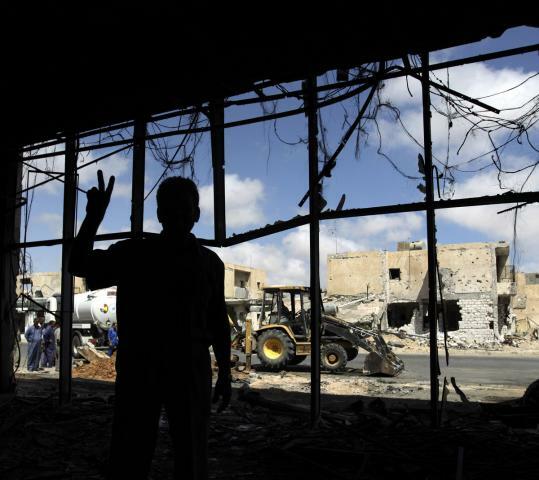 Officials estimate US costs in Libya will total $1.1 billion by early September. Under the War Powers Resolution, a president has 60 days from the start of military operations to obtain congressional authorization or withdraw forces from the fight. In the case of Libya, that deadline expired last month. The House voted June 3 to give Obama two weeks to comply, a deadline that expires tomorrow. At the heart of the administration’s argument is the nature of the US role in Libya, which has changed since Obama announced on March 19 the start of operations meant to protect Libyan civilians from forces loyal to Khadafy, who had threatened reprisals against the residents of the rebellious city of Benghazi. After taking the lead in destroying Khadafy’s air-defense capabilities, US military commanders turned over day-to-day control of the operation to NATO. Obama declared at the start that no US forces would serve on the ground in Libya, and he has maintained that position. The bulk of the US mission now involves providing aerial surveillance, targeting information, refueling capabilities, and other support for British, French, and other NATO war planes. The War Powers Resolution has been ignored by past presidents. But Obama, a former constitutional law lecturer, came to office pledging strict adherence to the rule of law.